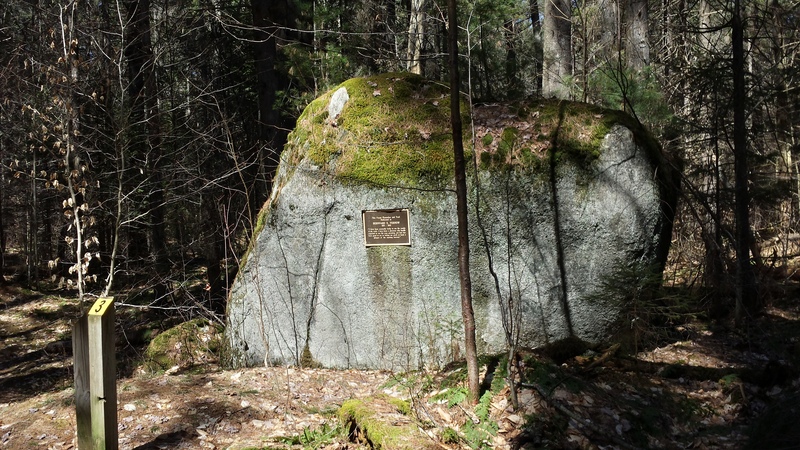 If you find yourself in New York’s Adirondack Park, be sure to add a walk through Fernow Forest to the Forest History Bucket List of things to do while there. It’s a nice place to spend an hour or so stretching your legs and learning about Bernhard Fernow, an important yet underappreciated figure in North American forest history, while looking at a sample of his work in New York. Make no mistake: visiting either forest in the United States named for Bernhard Fernow is worthwhile. In West Virginia is the Fernow Experimental Forest on the Monongahela National Forest, operated by the U.S. Forest Service. This 4,300-acre forest offers mountain biking trails and other recreational activities. I’ve not been there yet, but it’s on my bucket list. The one in the Adirondacks is under the control of the state’s department of natural resources. It’s fitting that Fernow has two forests named for him. As chief of the U.S. Division, predecessor to the U.S. Forest Service, of Forestry he placed the small bureau firmly on scientific footing, writing scores of reports and conducting and coordinating research. Such efforts during his twelve years with the division (1886–1898) make him one of the founding fathers of American forest research, something he rarely receives recognition for. He is better known as the father of professional forestry education in North America. A long-time advocate for forestry education in the America, in 1898, he left the Division of Forestry to establish the New York State College of Forestry at Cornell University. It was the first professional forestry school in the United States (meaning, the first school to offer a college degree). After the school shut down in 1903 (see below), he taught at Yale’s forestry school and elsewhere for a few years. In 1907, he founded the forestry program at Pennsylvania State College’s main campus, teaching there in the spring of 1907 before heading to the University of Toronto and establishing Canada’s first forestry school, where he stayed until his retirement in 1920. The Fernow Forest in West Virginia is a nod to his research leadership; the one in the Adirondacks is one to his work in forestry education. Fernow located Cornell’s experimental forest on 30,000 acres in the heart of the Adirondack State Park, a decision that would contribute to the demise of the school just five years after it opened. He clearcut the hardwood forest and ordered the planting of the commercially valuable species of white pine and Norway spruce as part of his effort to demonstrate that good forest management could pay. The school sold the lumber to the Brooklyn Cooperage Company, which had set up a mill on the site. Unfortunately, the operation was near several wealthy landowners who didn’t care for the noise and smoke coming from the school’s woods and petitioned the governor to shut down the school. He complied by eliminating funding for the school in 1903, effectively killing it. Don’t blink or you’ll miss the sign. But walking the Fernow Forest Trail in the Adirondacks can help a visitor understand what he was trying to accomplish. It was no small goal he had in mind, trying to teach his students the fundamentals of forestry and demonstrate to an indifferent country that forest management could turn a profit and produce a steady supply of lumber. Located on a 68-acre tract that was once part of the school forest, the trail is a under a mile long, a well-groomed dirt path that’s fairly level and easily navigated. Much like Fernow the historic figure, it’s easy to overlook the trail along the road. Marked by an underwhelming sign, with parking in a pullout on the shoulder of NY 3, you have to pay attention when looking for it or you’ll go right by it. Unlike the Carl Schenck Redwood Grove in California, which is a good distance from the road, you never quite get away from the sound of cars in Fernow Forest. Also unlike Schenck Grove, which celebrates the man and his ebullient spirit, Fernow’s trail is like him—all business, with an emphasis on education. This trail not only informs you about Fernow and the school, but also how and why he was managing the land, what has occurred on the land since the school’s demise, and a bit about the geological history of the land. The forest is no longer actively managed except for trail maintenance done by students from nearby Paul Smith’s College (also worth visiting). With that background, let’s get going. 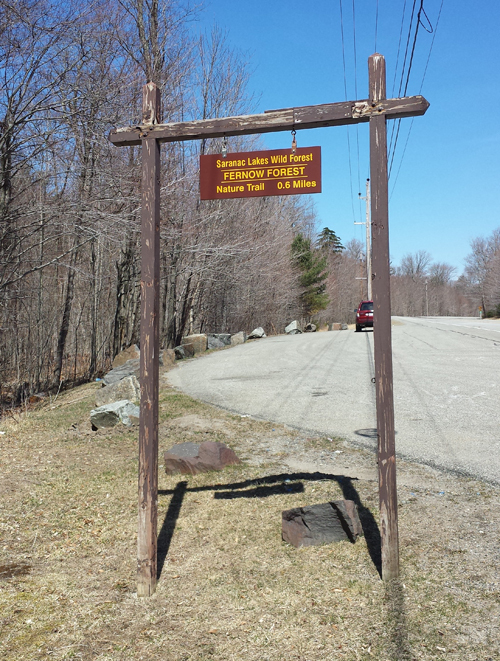 When you start the walk, be sure to sign in at the trailhead so the state knows how many people use it. 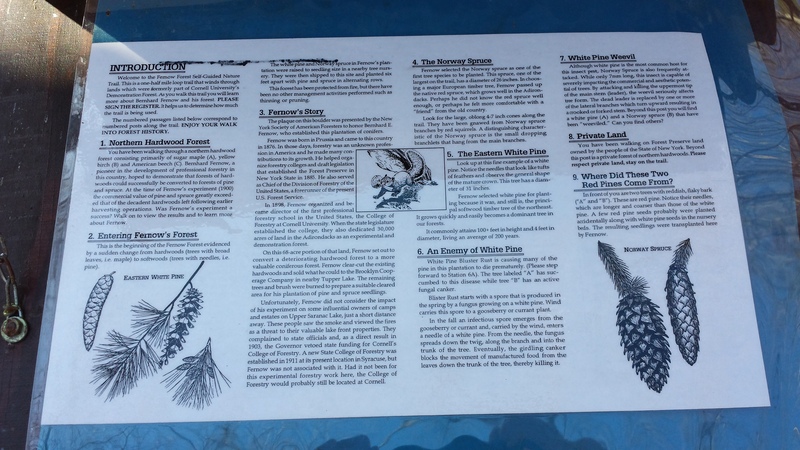 Borrow a laminated trail map, which interprets the different stops along the trail. Be sure to peruse the sign-in sheets to see where others visited from. Someone from France had visited not long before I did. Click on the image to read the pamphlet. At stop #1, you learn that you’ve been walking through a northern hardwood forest and are about to transition to the softwoods of the Fernow Forest (which begins at stop #2). It consists largely of Norway spruce and eastern white pines (indicated with signs at stops 4 and 5, respectively) planted at Fernow’s direction in rows. Most rows are still visible, running perpendicular to the trail. Stop #3 commemorates the man himself with a tablet attached to a massive boulder. The absence of a death toll in the catastrophe is due to the heroic measures taken by the citizens, who rushed into the waters of the lake and defied suffocating heat and smoke by means of wet blankets. Only such measures saved many of the women and little children, the intensity of the fire being shown by the burning of the very reeds along the shore and surface of the lake. Fortunately, historians Peter J. Murphy, Cordy Tymstra, and Merle Massie document the Great Fire and its impact and legacy—and why it faded from memory—in “The Great Fire of 1919: People and A Shared Firestorm in Alberta and Saskatchewan, Canada,” available in the most recent issue of Forest History Today. The Great Fire is not the largest on record. That honor belongs to The Chinchaga Firestorm, the largest wildfire ever documented in North America. But what sets it apart from others is the fire’s lasting impact on the landscape and soil, fire policy, and ownership of public lands—impacts the “The Great Fire of 1919” details. January 31st is more than just Super Bowl Saturday here in the U.S. It’s also the anniversary of the founding of International Paper. * On this day in 1898, fourteen paper companies came together and incorporated as International Paper (IP). Capitalized at almost $40 million dollars, IP included seventeen pulp and paper mills operating 101 paper machines with close to 1,500 tons of daily output capacity. The new company supplied 60 percent of all American newsprint in the world’s largest market for printing paper. Company executives hoped the large-scale merger would bring some stability to a volatile market that had seen the huge rise in production output far outstrip demand in the last decade of the nineteenth century. Several issues and factors, however, contributed to IP’s market share plummeting from that initial 60 percent in 1898 to 26 percent by 1913. The latter year saw the passage of the Underwood Act, which abolished tariffs on Canadian newsprint imports and made newsprint the first major commodity to enter the U.S. virtually duty free. Abolishing the tariff fundamentally changed the industry and initially caught IP unprepared for the rapid changes. With an infinitely larger supply of spruce trees for turning into newsprint pulp, Canadian producers began turning out newsprint for much less than IP and other American companies. IP responded by shifting its newsprint production to Canada. During the 1920s, IP went on a building and buying spree in Quebec and the Maritime Provinces, including completing a mill at Three Rivers, Quebec, in 1922 and one in Gatineau, Quebec, in 1927. Canadian International Paper Company mill at Three Rivers, Quebec, 1930. The mills at Gatineau, Dalhousie, and Three Rivers (seen above) were operated by Canadian International Paper (CIP), a wholly owned subsidiary formed in 1925. Again, factors and trends worked against IP and made it difficult for IP to realize an adequate rate of return on its $60 million investment in Canadian newsprint. All this occurred just before the onset of the Great Depression, when IP’s foray into Canada nearly wiped out the company. Long story short, the company survived because of its production of kraft paper and other consumer goods and still thrives today. In fact, today it is a Fortune 500 company. But IP’s survival and revival is a story for another day. What does this have to do with the Super Bowl? Frankly, nothing. I just wanted to get your attention by mentioning it and then rhetorically ask, Arizona? Really? But the emphasis on the Canadian side of IP’s story is no accident. It’s an excuse to draw your attention to some holdings in our archives relating to Canadian International Paper. For your listening enjoyment, archivist extraordinaire Eben has pared down audio files we have of programs done for radio broadcast in 1948. The programs were sponsored by CIP and, not coincidentally, are about CIP operations. The first clip highlights the newsprint creation process at the Gatineau, Quebec, paper mill and the second clip provides a profile of the same plant and its importance as a CIP mill town. Both clips are about four minutes long. So, phone the neighbors and wake the kids! Gather them around the computer speakers and listen to these exciting stories of yesteryear! * This entry borrows heavily and shamelessly from Thomas Heinrich’s fine article, “The Case of International Paper, 1898-1941,” Business History Review Vol. 75, No. 3 (Autumn 2001): 467-505. For an overview of the history of International Paper, see “A Short History of International Paper: Generations of Pride,” Forest History Today, 1998. For more on the history of newsprint and the history of Canada’s forest industries, check out these two FHS publications: the Issues Series book Newsprint: Canadian Supply and American Demand by Thomas Roach, and Lost Initiatives: Canada’s Forest Industries, Forest Policy and Forest Conservation by R. Peter Gillis and Thomas Roach and co-published with Greenwood Press.